A cross-agency resource for districts to understand the policy, research, practice and funding components to implement online and blended learning. In addition, DPI staff have created online assurances and key planning resources for districts as they consider options that relate to serving a wide variety of students. United States Department of Education, Office of Educational Technology, Dear Colleague Letter on January 18, 2017 . (Accessed January 29, 2017). The Dear Colleague letter explains the opportunities for integrated budgeting across all of the title programs for data, digital learning, infrastructure, data privacy (inclusive of data privacy, cybersecurity, and digital citizenship), hardware, digital resources and professional learning. Mooresville’s Mark Edwards describes how it took his district five years to become an overnight success. Webinar featuring four school districts discussing how they implemented a digital conversion. This interactive video profile of the Quakertown Community School District (QCSD) is the first of a series about how district and school leaders are working to improve student learning outcomes through the effective use of digital learning. 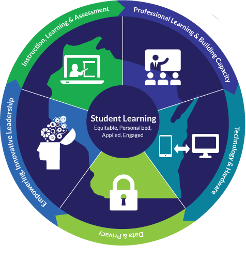 Summarizes four overarching models of blended learning. Describes and gives examples of how technology creates fundamental structural changes that can be integral to achieving significant improvements in productivity in both teaching and learning. Project Red. 2014. Revolutionizing Education: What We’re Learning from Technology-Transformed Schools. (Accessed January 7, 2017). Provides an overview of two districts in different parts of the country who chose to examine the way learning is delivered in their districts and how they have enjoyed both improved learning outcomes and positive economic impacts. District 219. 2009. 219 Anywhere Anytime Learning Plan. (Accessed February 10, 2017). A planning document for anywhere, anytime learning in District 219 Niles Township High School District. DailyHerald.com. 2013. District 207 replacing textbooks with Chromebooks. (Accessed February 12, 2017). Provides a summary of how Maine Township High School District 207 freshman and sophomore students purchased Google Chromebooks from the district as part of a program that would eventually eliminate the need for physical textbooks in the classroom. Provides a summary of how Leyden High School District 212 provided Chromebooks for 3,500 students. An analysis of the advantages of Chromebooks for K-12 education. A report of how a Houston, Texas district will fund its 1-to-1 program, dubbed PowerUp, with re-purposed savings, operating dollars, and grant funds. Provides some examples of how funds from ESEA (Titles I, II, III) and IDEA may support the use of technology to improve instruction and student outcomes. Dear Colleague letters are written as guidance for state education agencies to provide guidance and support for local education agencies. An article that describes how mobile technology will help shift instruction to be more collaborative, learner-driven and inquiry-based. This guide is intended to help districts address challenges of moving from a print-based to a digital-based curriculum. It provides context, effective practices, and resources and is divided into sections for planning, understanding digital content and curriculum options, and implementing with fidelity.